You are anxious to get into a pickup truck that is all your own. 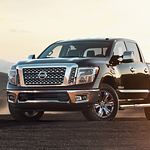 The Nissan Titan XD is a popular option and a full-size truck with many accessories available. You should come by Gillman Nissan Fort Bend to learn more about this truck and all that it offers. Want to make the license plate on your Nissan Titan XD stand out a little more than it does when you install it all on its own? There is a license plate frame available for this truck that is easy to put into place and that will help your license plate blend into the vehicle perfectly. Do you struggle to get into and out of your pickup truck? Or, do you have passengers that you like to take with you who have a hard time with that? There are step rails available for the Nissan Titan XD that give an extra boost to those who need it.